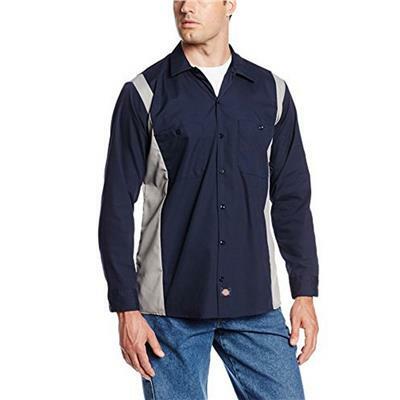 This Dickies LL524DNSM dark navy and smoke-colored long-sleeved industrial shirt has the Dickies logo on the left pocket and bottom of the button placket. It is made of 4.25-oz. poplin fabric and is 65% polyester / 35% cotton. The shirt has a permanent press finish for easy care. It has mitered front pockets with a pencil ision on the left pocket. It has a lined two-piece collar with permanent stays and button closure. This work shirt is fade-resistant and safe for industrial laundering. Imported.Williamson-Dickie Manufacturing Company manufactures work apparel and accessories under the Dickies, Kodiak, Terra, VanMoer, and Workrite brands. The company, founded in 1922, is headquartered in Fort Worth, TX.